PLEASE NOTE – This course is now full. If you wish to be added to our waiting list, please do send in an application form for our consideration. You can also contact us at training@opusmusic.org to be added to our mailing list for future training opportunities. Applications are now open for our 5-day Music in Healthcare Settings Training course based in Derby and Sutton in Ashfield, UK. We will be offering places on the training programme as we receive suitable applications. We will close the application process once all eight places have been filled. You are encouraged to apply as soon as possible and before the deadline of Friday 9th March 2018 as places could fill up quickly. If you are at all interested in how music can be used as a vehicle for better health, happiness and well-being…DO THIS COURSE. It was one of the most moving, enlightening and humbling weeks of my life and has confirmed 100% for me that I’m on the right path musically, professionally and personally. This training was all about fabulous human encounters in music: with the patients, their relatives, the hospital staff, my fellow trainees, and of course with Nick, Sarah and Richard. I would recommend doing this training if you feel excited about the possibility of using music to enrich and even transform lives in a setting that is a long way from the stage. 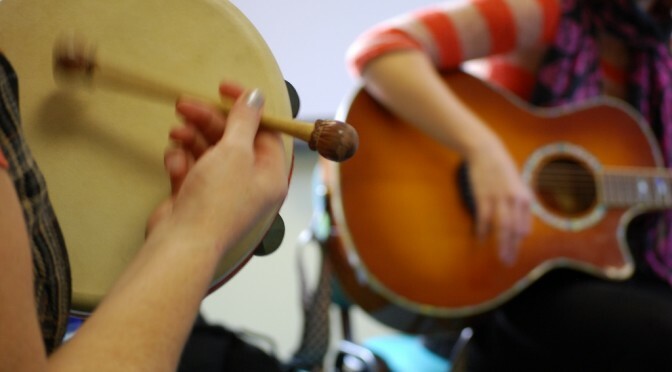 This course has the potential to redefine your ideas of musical performance and what it means to connect with others when making music, in healthcare settings and beyond. My notions of musicality were challenged and broken open to reveal once more the true beauty of creativity. Something I am thankful for. The course is an absolute must for musicians, healthcare staff and humanity as a whole. Training with Opus has been an incredibly creative, exciting, moving, challenging and fun five days, that have inspired me musically and personally. I feel privileged to have met such creative and talented musicians, and feel compelled to tell everyone about the immense power of music in the hospital setting! Every moment of the course is crucial to exploring the role of the musician in a healthcare setting. The team of professional and well-experienced facilitators firmly ground the profession within its social and cultural context and offer a structured introduction to cutting edge techniques and exploratory, collaborative experience within the hospital setting itself. I would whole-heartedly recommend attending a course with OPUS to any musician looking to have an impact in this growing area of expertise. The course is incredibly fulfilling and so valuable. It was unique in how engaging, rewarding and informative it was, as well as fun! I felt at ease quickly and thoroughly enjoyed how much I learnt, both in the experiences it gave but also the practical tools I have acquired to develop my own practice and passion for music in healthcare settings.